I have been rereading the excellent The Perfect Summer : Dancing into Shadow England in 1911 by Judith Nicolson, for the second time. Ms Nicolson is the granddaughter of Vita Sackville-West, and from the fragrant confines of Sissinghurst, she is able to draw on all kinds of personal info from Great Aunt this and Great Grandmama that on all things decadent and Edwardian. Her acknowledgements page features the kind of very grand characters who the Mitfords would have known. This is a fine history book, mainly because it divorces itself from the canon of history books by actually being readable. It focuses on six individuals from various slots in the strata of the English class system and tells the story of a nation at a time of a glorious, over-hot, decidedly poignant summer, cripplingly held on the brink of imminent disaster, when the world of Edwardian England is about to be blasted to smithereens by the trench warfare of the First World War. One of the delightful debutantes towards which Ms Nicolson casts her tidy pen is Lady Diana Manners [pictured above],later Lady Diana Cooper: fashionista, cloche hat wearer, Vogue powerhouse, Slade Art School attendee and general Edwardian It Girl. As well as being something of a modernist loon by Edwardian standards, painting her bedroom at Belvoir Castle black, practising boxing daily and sniffing ‘chloro’ (chloroform) for high jinks amongst her high class Edwardian coterie, Lady D Manners “comes out” in the book. 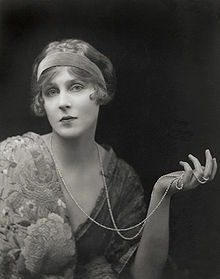 Now, Ms Nicolson doesn’t of course mean coming out in her grandmother Vita Sackville-West’s meaning of the phrase, because there appears to be nothing remotely Sapphic about Lady M. She was far too busy winning costume balls and wearing double layers of crimson lipstick for any lesbian activity. No. Lady DM was part of that unfortunate racket that was compulsory for ladies of her class and era : The Season. During one’s first season you were pushing your marriageability if you didn’t get a proposal. Lady DM feared that the ostrich feathers she was forced to wear for Royal presentation would make her look faintly ridiculous. This was before she took into account that everyone wearing Edwardian high class fashion looked like a cross between a stuffed fabric cushion and a drunk giraffe. By one’s second season, matronly eyebrows of maiden aunts were raised slightly : you were desperate for a proposal by one’s second season but had to appear not desperate. By the third, it was India or spinsterhood, and no one ever quite agreed which was worse. Lady M didn’t have any of that, of course. She was too busy designing Russian-inspired dresses with fur lining whilst sitting in draughty corners of Berkeley Square dances or rocking up to the ancestral pile to get pissed with young fey chaps called Kim. The supper menus for these Edwardian balls for the Season never varied. They featured an alarming amount of hothouse peaches and strawberries, soup (hot and cold) and oysters and lobsters. It was a kind of Carole Middleton-friendly menu, bereft of carbohydrates and excitement. At one costumed ball, Lady M won 250 guineas for her fancy dress costume – which, Nicolson points out, was the equivalent of five years’ income for a labourer at the time. Lady M planned to spend the money on books. Devonshire House was a key site for all things Season. It is now the home of Iran Air, as Devonshire House, including its 3 acre garden housing the Duke of Devonshire’s personal tennis court, was mown down in Piccadilly in 1935. Iran Air is a particularly dispiriting office featuring sloppy grey furniture with holes in and a window which appears to have never known a windowcleaner. You would find it nigh impossible to imagine a 1911 upper class toff rolling cherry brandy cocktails around his delightfully plummy mouth, surrounded by rose bushes filled with pink electric lights in the hazy garden and then gamely making a tremulent pass at Georgiana in the corner to whip her round the dancefloor to Alexanders Ragtime Band. I don’t think anyone’s tried that in the offices of Iran Air. The great thing about Nicolson is that she is a splendid storyteller as well as a well-informed historian – if only she referenced her books, we would be able to find out where she has trawled through stacks of books to find her information – and she also has the canny eye for the personal feelings of her characters, although perhaps here she takes a liberty better suited to the writer of fiction, to state how Queen Mary was feeling at a given time, and to furnish this book with a huge amount of inner feelings of people who she cannot have met, unless she is 140 years old. The effect of this, of zooming down through the telescope of historical context to a small, plaintive, individual detail, is smashing for the reader, and presents a series of heartbreaking snapshots that tell more about a moment than a paragraph of dry socio-economic detail could : the choirboy’s mis-spelt name on his Coronation entry card, the smell of the Blenheim footman’s powdered hair, the luscious breakfast in the mornings at Belvoir Castle, with red flags signalling the Indian tea pot and a yellow flag for the Chinese tea, the filth and stench of Hyde Park Corner, with its combination of deisel fumes and horse manure as the motorcar takes hold and the lady of means in the back of the car pokes the neck of her driver with her parasol to indicate which route to take, the nerves of the ballet dancer Nijinski, evident in the twisting of his thumbs and fingers at Richmond tea parties, the loneliness and sexual isolation of the poet Siegfried Sassoon through the long Kentish summer and – perhaps rendered the most futile vision by the facts that followed – the garden of The Old Vicarage at Grantchester, littered all summer with books of the poetry writings of its lodger, Rupert Brooke, the pages gently fluttering in the occasional, peaceful summer breezes. Perhaps among those books, was his poem, The Soldier, published the following year, the famous opening of which “If I should die, think only this of me / That there’s some corner of a foreign field that is forever England…” banging on about the nobility of being of English matter in an eternally English earth and dying for war. It took The First World War only eight months to claim Brooke. His was an ignoble death of sepsis from an infected mosquito wound on a lonely Greek island. One wonders what he must have thought of England then. I am mainly re-reading this quite gorgeous book in order to fall into Nicolson’s next : The Great Silence : 1918 – 1920 Living in the Shadow of the Great War. Now, that one is really going to be great. It is going to thoroughly depress me. The great sweep of Edwardian niceties destroyed by the war, the shell shock, the return home, the black-edged telegrams of notifications of death, the dead poets, and the irretrievably lost England. Goodbye To All That. Jeez. I’ll be lucky to make it to Juliet Gardiner’s The Thirties. That’s where I am going next (if I don’t end up in Post-Great War Therapy first). After being depressed and upset following the detritus and flotsam and jetsam left in the wake of a great catastrophe I am going to cheer myself up by reading about means testing and economic depression and Orwellian urban poverty. Honestly, History books rock. And, should I survive the major onslaught of margarine, trench foot, poverty and terror that is the early twentieth century, I shall presently be rolling out the barrel with another of Gardiner’s fruitiest, The Blitz: The British Under Attack. Whatever I do read about the twentieth century, I certainly shall not be reading anything about The Titanic. If I read any article, view any miniseries or catch the self-satisfied smug smile of the Winslet from a national newspaper again in the next three weeks I shall scream. I think the low point was in last Sunday’s The Observer, which, for reasons only connected to mawkish commercialism, enclosed an A1 size ship plan, replete with third class dining saloons, drawing of promenade decks, snapshots of the Captain and a picture of the iceberg. It sank. I get it. Tons of ships sink because of idiots who don’t read ice warnings. Why are we always reading about this one? Who gives a crap whether Lady GnarFnar and Lord FnarGnar of the Ostentatious Rifles Regiment survived or whether there was apple cake for dessert in second class or whether Leonardo di Caprio shagged Kate Winslet whilst pretending to “paint her portrait”? An entire section of my local Waterstones is devoted to Titanicism. We have menus from the Titanic, drawings of people who may or may not once have seen the Titanic, books about people who have been seen discussing Titanic at bus stops, information on floral displays within the Titanic and instructions for Titanic cocktails which, I can only imagine, include an awful lot of ice. Avoid the ship that wasn’t in shipshape shape. Head for the History drawer and collect either of Judith Nicolson’s, for an intimate portrayal of country first in grandeur and then in trauma, which is made real and accessible by the articulation of personal impact on a series of real individuals. Yes, there is an awful lot of info that Deborah, Duchess of Devonshire and similar high born peeresses probably gifted to Nicolson over steaming tea and Chatsworth crumpets, but this kind of verbal history dies with its speaker unless someone crystallizes it and writes it all down, and there is no one better to tell us about history than the people who made it. Nicolson’s books are gems. Anyone who is interested in the first twenty years of the last century and the world that shaped our grandparents will find them touching, fascinating and brilliantly written, as the effects of the national and the political are effectively distilled into the personal. The history is in the detail. These are wonderfully evocative books, ones I found strangely compelling. Go and read them.